Sometimes the unexpected makes a trip a little more exciting. Heading west on Thursday, we had a nearly three-hour delay leaving Pittsburgh International Airport, which would’ve made our connection at O’Hare a little interesting had that flight also not been delayed more than an hour. Then, upon boarding in Chicago, we sat on the plane for another hour before the pilot informed us a minor mechanical issue would cause us to deplane and we would have to wait for another plane to be rerouted. We ultimately landed in Bozeman at 1:34 a.m. But, we were in Bozeman. Finally. First fish of the trip – Hyalite Creek rainbow fooled by a stimulator pattern. After a few hours of sleep we made a quick stop for breakfast and visited one of the local fly shops to purchase our licenses and glean some intel on the local waters. Many were still running high due to snow runoff but we quickly formulated a plan to hit both new and familiar public access areas. Our first stop was Hyalite Creek in the Gallatin National Forest and the five of us connected frequently on nice-sized rainbows. We made a mental note to make another stop in the area in the future. 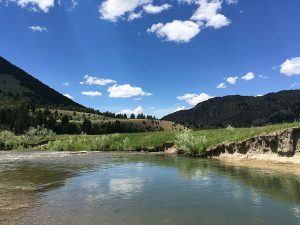 We followed that with a stop a bit west at Spanish Creek, which is also in the Gallatin National Forest and a location we have fished previously. 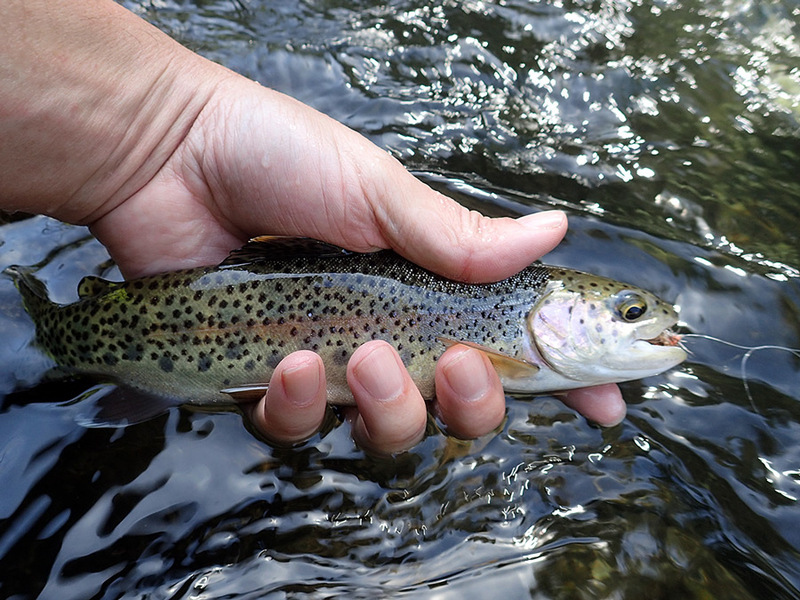 A number of brookies and cutthroats cooperated and the trip was off to a great start. I’m not one to gauge a day’s fishing by the number of fish caught or their size. Neither are the other guys in the group. It takes away the pressure and puts the focus on our experiences. We are in Montana. We’re going to catch fish. Some will be big. Some will be small. It doesn’t much matter. We moved on toward Ennis, our destination for Friday night. Before checking into the Silvertip Motel we hit the famed Madison River as it courses through Bear Trap Canyon in the Lee Metcalf Wilderness on the edge of town. The Madison was running at about 2,500 cubic feet per second, which proved to be quite turbulent and virtually unwadeable so we changed tactics and targeted nice-sized rainbow and brown trout close to the banks and were not disappointed. The big sky of Montana above Spanish Creek. It was a long and prosperous first day drifting on new water and old. Despite being drained from Thursday’s travel and a long time on the water, we headed into town for dinner and spent the evening enjoying the local flavor at the Longbranch Saloon – a Drifter favorite. This time, being up past midnight was by choice and infinitely more pleasurable. There is nothing like a western town letting itself loose on a holiday weekend. We wanted to make the most of it – fatigued or not. Our ultimate destination beckoned Saturday and we left Ennis for Upper Canyon Outfitters and the Ruby Valley Saturday morning. We passed through the preserved old west outposts of Virginia and Nevada cities en route to UCO, which sits at the convergence of the Snowcrest, Gravelly and Greenhorn mountain ranges, 12 miles from the nearest paved road. A secluded section of the Ruby beckoned first, however, and any fisher knows it’s impossible to resist the draw of willing trout eager to placate a group of weary travelers.